Having explored the music of Rachmaninov, Prokofiev, Kabalevsky and Shostakovich, cellist Leonard Elschenbroich turns his attention to Alfred Schnittke. Elschenbroich is joined by pianist Petr Limonov for a recital on Onyx which includes Schnittke's First Cello Sonata (1978), Suite in the Old Style (1972), Madrigal: In memoriam Oleg Kagan (1991) and Musica Nostalgica (1992), plus Elschenbroich's own Shards of Alfred Schnittke (2008). In his note in the CD booklet, Elschenbroich talks about the word nostalgia, and how in Russian it has a somewhat more painful, more severe meaning than in English, and 'Nostalghia' is regarded with respectful fear. Schnittke's music, with its poly-stylism, often represents a dialogue with the past, so that even the most old style music on the disc, the Suite in the Old Style has moments when the present breaks in, we are certainly not allowed to wallow in the past. (In the CD listing on the box the piece is referred to as Suite in the Old Style, but in Daniel Jaffe's article the work loses the definite article). Leonard Elschenbroich and Petr Limonov start with Schnittke's First Cello Sonata written for Natalia Gutman shortly after Schnittke had written his Violin Concerto No. 3 for Gutman's husband, the violinist Oleg Kagan. The sonata is in three movements, each progressively longer than the previous. The opening Largo is like a prelude starting with a long poetically austere cello solo, as the piano joins the music develops in passionate intensity leading to the second movement Scherzo. This starts off with the cello playing quiet and fast, with violent piano chords interrupting. The resulting mix is hardly a joke, nor is it sardonic in the way of Shostakovich, it is full of anger and strong feelings, a furious toccata with moments of intense violence. The final movement starts with a keening high on the cello, the piano accompaniment gradually developing from just a few chords. Elschenbroich gives a terrific, intense performance, really bringing out the powerfully elegiac sense in the music; a keening lament which reaches a climax and the unwinds to the bare, bleak end. A powerful work indeed, and a disturbing one. From 1962 Schnittke made a living writing for films, and Suite in the Old Style reworks music from two films Adventures of a Dentist (1965) and Sport, Sport, Sport (1971) into a suite written originally for violin and piano. The five movements demonstrate Schnittke's fascination for music of the Baroque and Classical periods (which seems remarkably at odds with the films' subject matter). This is very much a dialogue with the past, so the present breaks in with little modern touches, as well as more dramatic moments. For the final movement, Pantomime, the music also recalls Paderewski's own evocations of the past. The violinist Oleg Kagan developed cancer in his early 40s, dying in 1990 but performing to the end. In 1991 Schnittke wrote Madrigal: In memoriam Oleg Kagan for solo violin, subsequently Schnittke re-wrote it for cello and in this form it was premiered by Oleg's widow Natalia Gutman. The piece lasts some eleven minutes and is for cello alone, starting from a single line barely there, a series of long held notes which grow to resemble keening. As the intensity develops so Schnittke creates to lines on the cello. The result remains spare, but intense and truly remarkable. Musica Nostalgica was written in 1992 for Rostropovich, a short piece which revisits the minuet from the Suite in the Old Style. The opening for solo cello feels very Bachian and then when the piano enters things grow more Romantic. Again the music becomes a dialogue with the past, and there are 21st century moments along the way. The theme from the minuet crops up again in Leonard Elschenbroich's Shards of Alfred Schnittke on the 10th Anniversary of his death which includes fragments of Schnittke's music in the context of Elschenbroich's own voice. 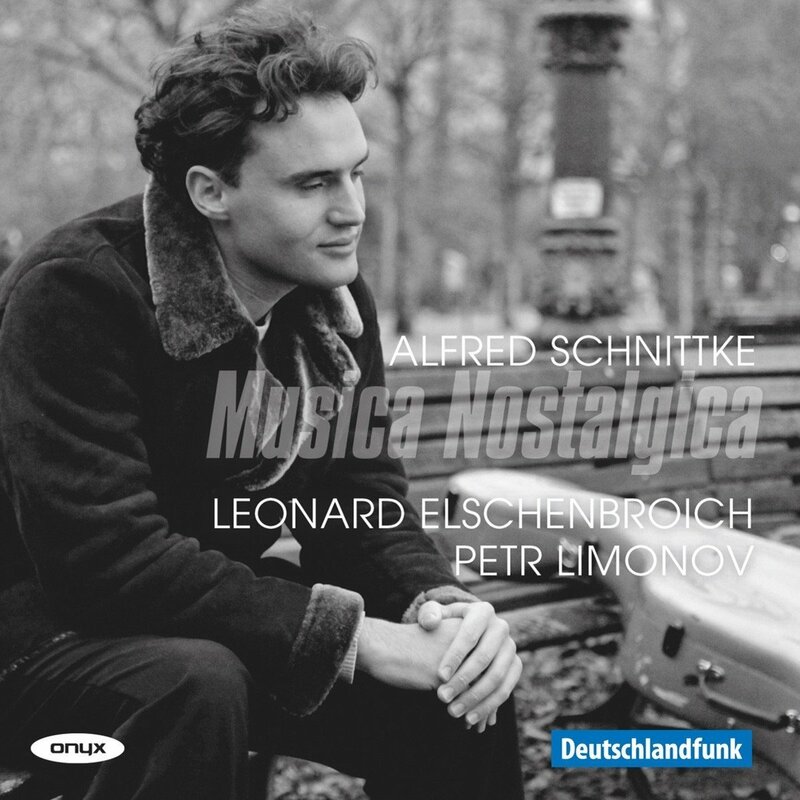 This is a terrific recital, Leonard Elschenbrocih and Petr Limonov produce stunningly intense realisations of Schnittke's vividly imagined music. And the intelligently put together programme really brings out Schnittke's dialogue with the the past.